Oktoberfest is not complete without the traditional clothing. Lederhosen and dirndls are the most popular attire worn at Oktoberfest. When throwing an Oktoberfest party encourage your guests to try and look the part. 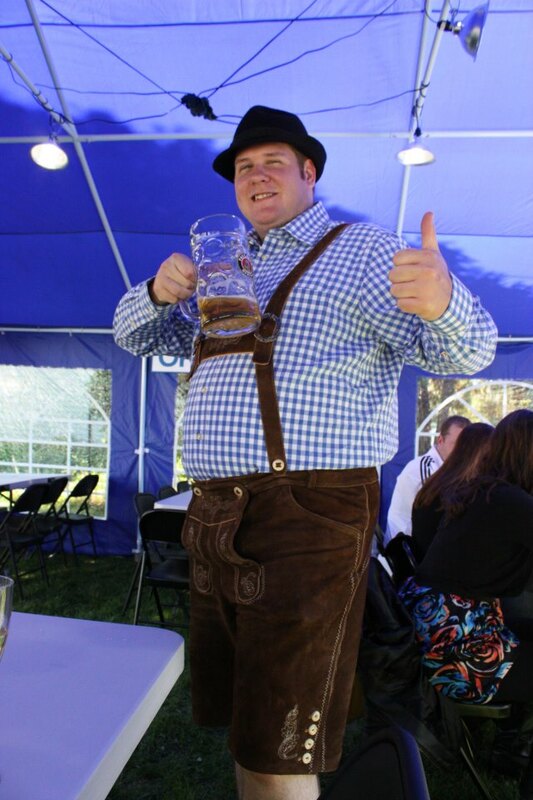 As a host of an Oktoberfest party, I would highly recommend purchasing real traditional lederhosen. But if it is not within your budget (and real lederhosen is a little pricey) there is always the Halloween costume stores that provide a great source for cheap lederhosen. A backup, is a pair of simple brown shorts, a nice checkered shirt, suspenders and tall socks with a good pair of shoes. It looks decent in my opinion and is my preferred alternative to real lederhosen. Lederhosen are essentially leather shorts. They vary in color and design but most are either brown or black with rich embroidering. Knee-length versions are called Bundhosen and tie under the knee. Lederhosen is usually accompanied with ornate suspenders and a checkered Trachten shirt. A trachten hat with gamsbart (a tuft of hair) is also a common accessory for men. The dirndl is a beautiful dress that is worn by many women at Oktoberfest.The dirndl is usually comprised of 3 pieces: the body of the dress which includes the skirt and bodice, the blouse, and the apron. Women, make sure to tie the bow on your apron correctly. A bow tied on your left side indicates that you are single. On your right that you are taken and tied in the back means you are widowed. Where to buy a dirndl or lederhosen? There are a number of places on the internet to purchase these items but not every site is authentic. A number of sites are just halloween costumes. Here are a couple sites that I would recommend to find the real deal. Bavaria Lederhosen offers lederhosen and dirndls for adults and children. They are located in Germany, ships to the United States. Oktoberfest.de offers lederhosen and dinrdls for adults and children. They are located in Germany, ships worldwide. Ernst Licht offers lederhosen and dirndls for adults and children. They are located in Pennsylvania. Bavarian Specialties, LLC offers lederhosen and dirndls for adults and children. They are located in Michigan. Touch of Bavaria offers lederhosen for adults. They are located in Oregon. Rare Dirndl offers dirndls and menswear for adults. They are located in Illinois. MyDirndl.com are importers of traditional clothing, decorations and other items from Germany and other European countries. The Christmas Sleigh offers authentic German and Austrian clothing, shoes, and boots.